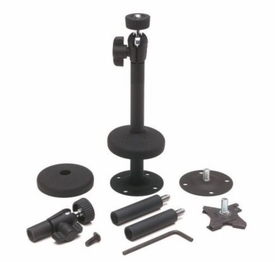 The Panavise Deluxe Micro Mount (black) is a highly versatile mount with a modular structure that offers 12 options for mounting your CCTV camera. Included in the package is a 2 in. (50.8 mm) round base with 4 holes on a bolt circle for solid surface mounting and a T-Bar Clip for drop ceiling rails. 2 aluminum shafts allow you to vary the mount's length, making it possible to have a mount that is either 2 in. (50.8 mm), 4 in. (101.6 mm) or 6 in. (152.4 mm) long. 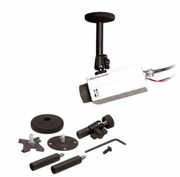 Camera positioning is simple thanks to the mount's ability to tilt up to 190� and rotate 360�, while a locking securely holds your CCTV camera in place. In addition, the mount features a 1/4-20 mounting stud, which makes it compatible with most cameras.